Greenland’s 2016 melt season started fast. 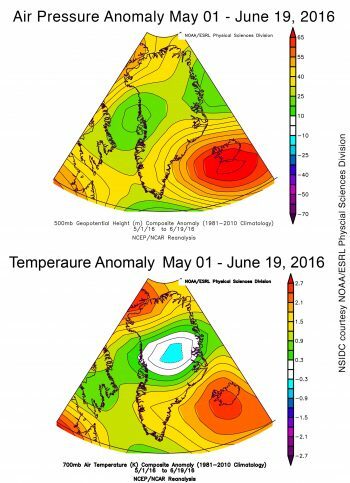 It maintained a brisk pace with three extreme spikes in areas of melt through June 19. On June 9, Nuuk, the capital, reached the warmest temperature ever recorded for the month of June anywhere on the island, 24 degrees Celsius (75 degrees Fahrenheit). Figure 1a. 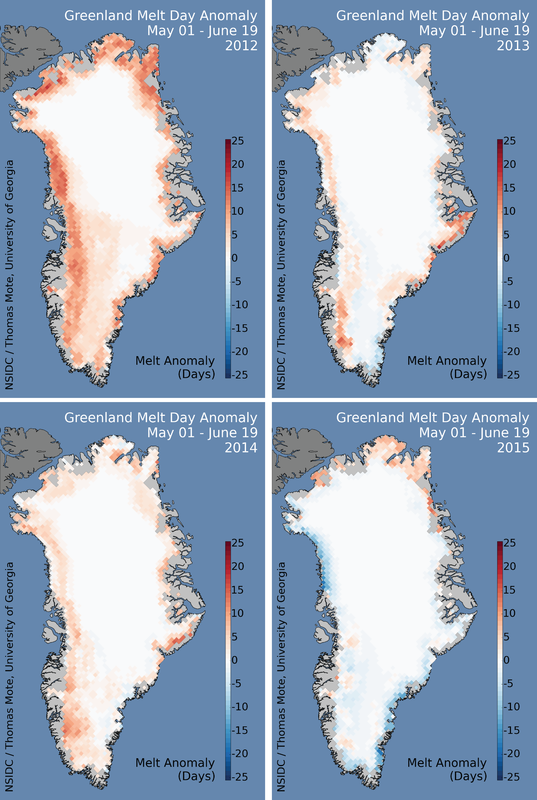 These maps show the cumulative melt day for the Greenland Ice Sheet as of June 19, and melt day anomaly relative to the 1981 to 2010 average for 50 days leading up to June 19. Below, a chart shows the daily melt extent for the year; the 2012 melt area curve is shown for comparison. Figure 1b. 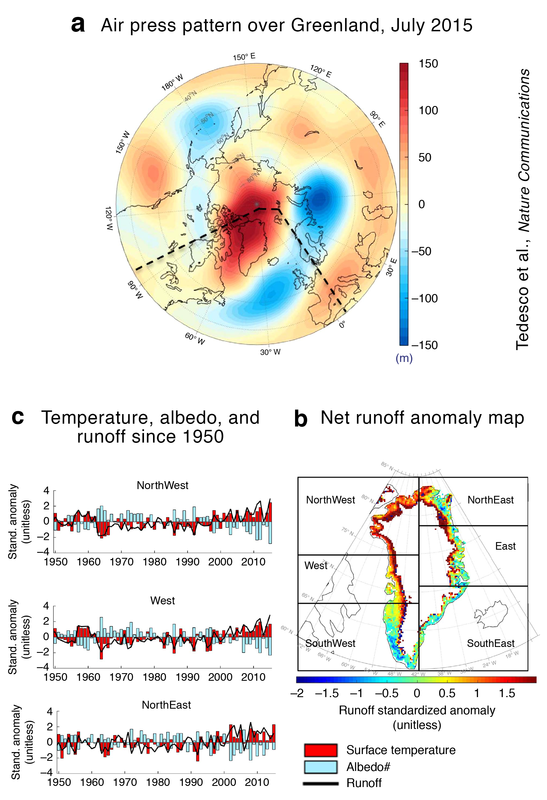 These maps show the melting trends for 2012, 2013, 2014, and 2015, with the same processing and reference period as the upper right map in Figure 1a. Each map shows the 50 days leading up to June 19. Fig 2a. The plot shows the height departure from average for the 500 millibar pressure level from May 1 to June 19. The reference period is 1981 to 2010. Figure 2b. The plot shows temperature departure from average at the 700 millibar level (about 10,000 feet above sea level) from May 1 to June 19. The reference period is 1981 to 2010. Warmer than average conditions (1.5 to 2 degrees Celsius, or 3 to 5 degrees Fahrenheit) were seen in the northern and southern areas of the ice sheet. A pattern of higher pressure over Iceland, and low pressure along the central western coast of Greenland, brought warm southerly winds to the southwestern coast. 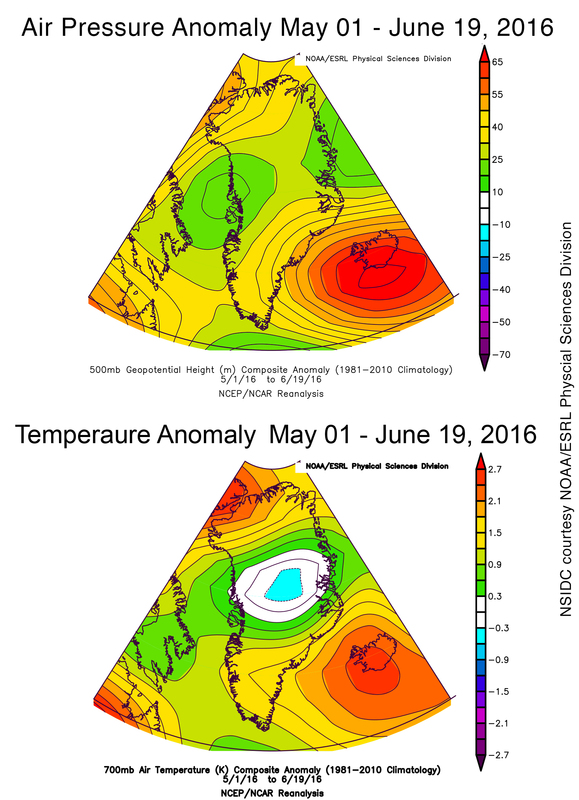 This trend was also observed in the early April spike in ice surface melt area. 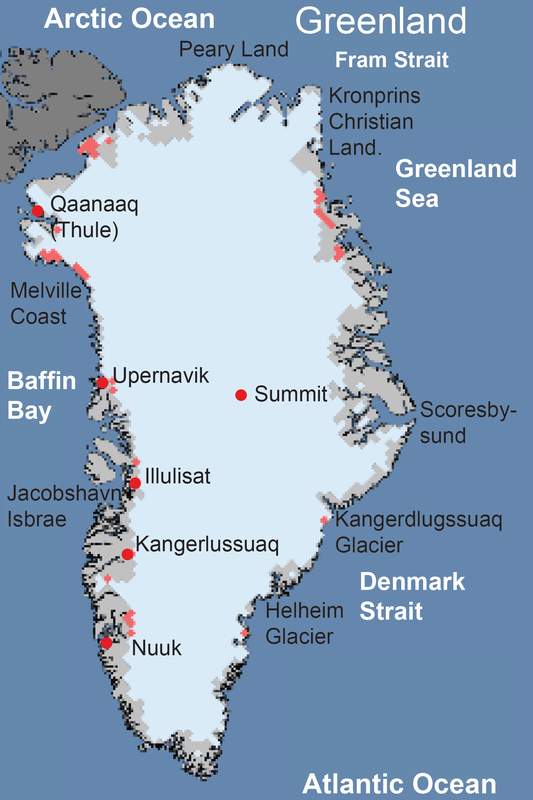 Temperatures were mildly warmer than average (0.5 to 2 degrees Celsius or 1 to 3.6 degrees Fahrenheit) over most of coastal Greenland but slightly below average in the interior. Air temperatures in Nuuk, the capital of Greenland, reached 75 degrees Fahrenheit on June 9, marking the highest temperature ever recorded on the island for June. When air flows downhill, air compresses and warms. The persistent high pressure pattern in northeastern Greenland forced downsloping winds, and with a low pressure center to the south of Greenland, temperatures rose. Such conditions are responsible for record or near-record warm temperatures along western Greenland. Figure 3. Top (a) air pressure pattern over Greenland and surrounding regions for July 2015, based on the altitude of the 500 hPa pressure level (high = high pressure). 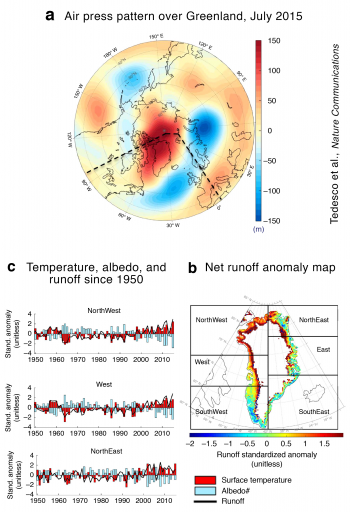 Lower right (b), a map of net runoff scaled by the average variability (i.e., the standard deviation of run-off for the 1981 to 2010 period) of the run-off for that region (e.g., ‘2’ means two standard deviations above average ; -2 means two standard deviations below average). Lower left (c) a series of charts showing the trends since 1950 for temperature, albedo, and runoff, again scaled in units of standard deviation. The upward trend for these three regions is related to the tendency for a persistent high pressure ridge north of Greenland, a ‘cut-off high’. Wind patterns and weather control the amount of melting on Greenland, and therefore the amount of ice that is added to the sea each year by meltwater runoff. 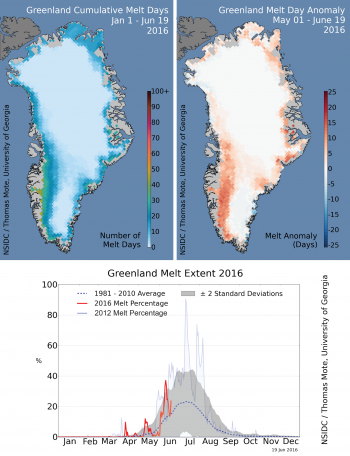 Using sophisticated climate models and past weather data that can reproduce the past conditions over the Greenland, a new study has shown that in 2015 Greenland’s weather changed to favor more melting in the northern part of the island (see GT November 2015 post). In earlier years, high-pressure systems over Greenland promoted increased melting in its southwestern portion. In 2015, a persistent high-pressure ridge set up further north, over the Arctic Ocean and the northern half of the island, pulling warm air northeastward over the southern half of Greenland, and shifting the areas of frequent melting northward. Snowfall increased in the south. The high-pressure system in 2015 ‘detached’ from the jet stream (e.g., a ‘cut-off high’ or ‘blocking high’) and became disconnected from the jet stream flow. Disconnected high or low pressure areas are more common when the meanders of the jet stream are more pronounced, pushing long loops high into the Arctic or southward into temperate areas. The exceptional 2015 summer Arctic atmospheric conditions saw a record high latitude of the jet stream flow and strong north-south winds (rather than east-west winds) in the North Atlantic and Baffin Bay areas. Greenland’s variable melt affected science teams working high on the ice. “As we crossed Greenland’s interior this spring, melt hounded us most of the way,” said CU Boulder researcher Mike MacFerrin. “As temps soared near freezing, snow began melting on our drills, causing them to occasionally freeze solid in boreholes as we worked. One of our stuck drills required 30 gallons of boiling water, aircraft cable, and a snowmobile to finally retrieve,” he said. Toward the end of their trip, the team worked through slushy days with nighttime temperatures only dropping to -1 degrees Celsius. “We got our work done, but the early-season melt tossed us curve balls along the way,” he added. 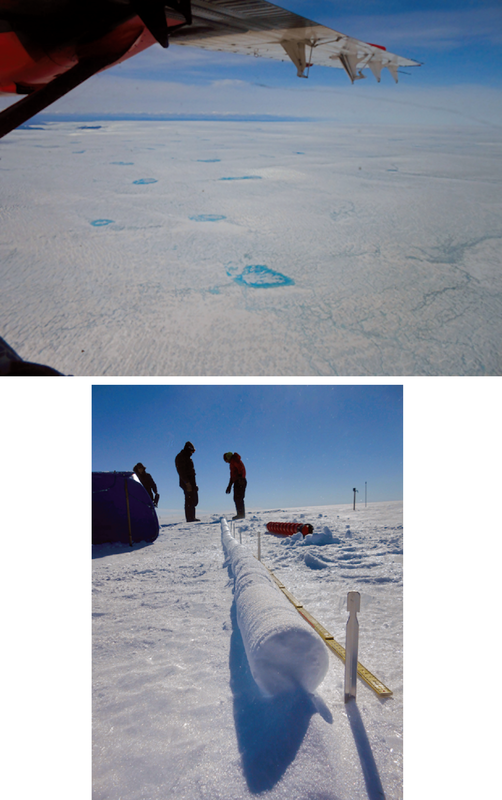 MacFerrin and the rest of the NASA-funded “FirnCover” team are primarily tasked with measuring firn compaction—the rate snow slowly compresses into glacial ice—which is crucial to accurately map Greenland and Antarctica’s changing masses. “The increases in high-elevation melt complicate everything we’re trying to measure,” MacFerrin said. “It’s the biggest factor reshaping the interior of Greenland’s snow and firn. Enhanced melt over the past ten to fifteen years has affected every site we visit.” Computer models simulate compaction, but most of the models were not intended to capture the types of rapid changes currently observed across Greenland. “We’re doing what we can to account for it, but we feel like we’re barely keeping up,” he said.